Macally TunePro review | What Hi-Fi? The dockers, it would seem, are taking over. 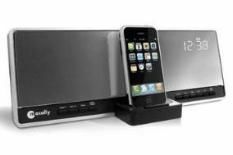 A great many manufacturers are jumping on the iPod bandwagon, turning out docking units that will make your brilliant little portable music/video players into something approaching a home hi-fi. This impressive small unit has a clear purpose – to get you up in the morning. The TunePro design is basically that of a thin, stylish clock radio, with a pleasingly sturdy iPod dock mounted in the middle. You can set dual alarms, choosing to be woken up the radio (FM/MW), by buzzer, or by the iPod itself. The radio has 10 presets, and there are some basic – though fairly effective – tone controls on the unit's rear. It works well. The TunePro's thin design is facilitated by its mirrored, flat-panel speaker: it vibrates with music (so perhaps best not to check your hair while listening), and it sounds cohesive and solid. The sonics are a little lacking in midrange body, but it's an extremely likeable unit, and worth an audition if you're looking for something to haul you out of bed in the morning.